Like an Old Italian Friend…. You been here two months back. Follow me, I got a table for you.” And so it goes at Joe’s Pasta House. Joe’s Pasta House reminds me of the countless small neighborhood Italian restaurants that dotted the Bronx and Brooklyn areas where I started out life. There’s a reason: Rio Rancho is like NYC neighborhoods transplanted to New Mexico. Listen to the accent spoken here. There’s no mistaking that the food is as it genuine as it was back there. The Rio Rancho area was originally part of the Alameda Grant, which was founded by the Spanish in 1710. By the early twentieth century, much of the land grant had been sold to land investment companies. Amrep Corporation purchased 55,000 acres in 1961 and turned the land into a housing development called “Rio Rancho Estates” with the first families moving in the early 1960s, most of whom were New Yorkers. The population grew tenfold between 1970 and 1980, and the City of Rio Rancho was incorporated in 1981. The opening of a large Intel Corporation plant in 1981 had a major economic impact on the city. Since the 1990s, Rio Rancho has taken steps to become more independent from neighboring Albuquerque, including the establishment of separate school and library systems and attempts to attract businesses to the area. The city’s latest project is the Downtown City Centre development that includes a new city hall building, a new UNM West and CNM campus as well as the Santa Ana Star Center. The arena opened in October 2006. City Hall opened in September 2007. 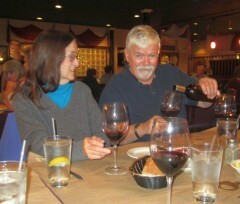 We enjoyed our first visit so much that we returned with our gastronome friends of some 40 years, Sally and Andy from Taos. Good choice, they said. 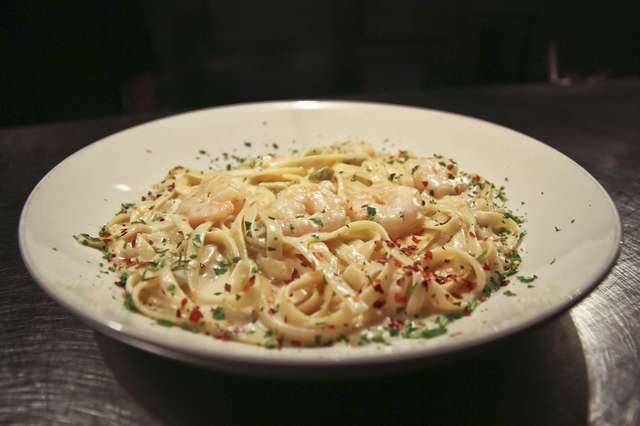 Southwestern Shrimp Fettuccine — Jumbo shrimp with green chile, crushed red peepers, and parmigiano cream sauce tossed with fettuccine pasta. Delicious. 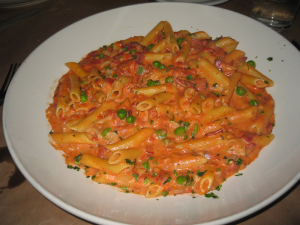 Carbonara — Fettuccine (or Ziti — my preference) pasta, green peas, red onions, and prosciutto in light pink sauce. Delicious, and very rich. My favorite version of this disk in the Duke City. Please have a glass of their very fine dark red Zinfandel. It gomplements the dish and stands uo very well to the carbonara spicing. Lightly tannic with a terrific finish. 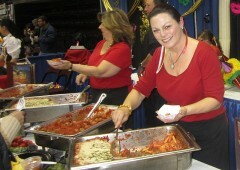 Ravioli Rustica — Round cheese-filled pasta in a tomato cream sauce with Italian sausage and fresh herbs and spices. Wonderful. 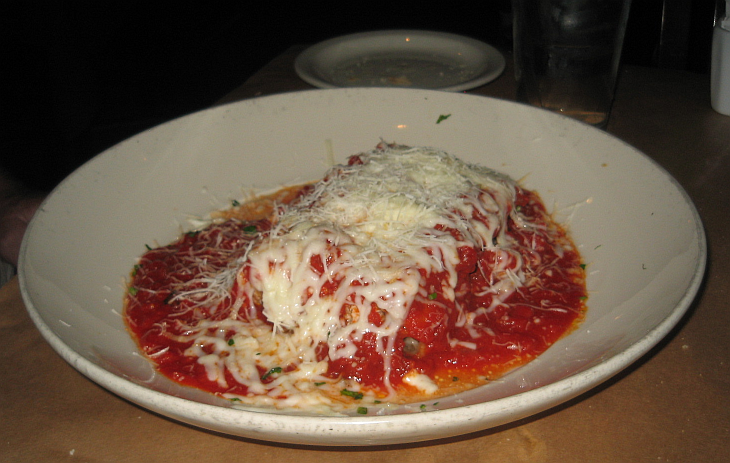 Baked Lasagna — One of the very best lasagnas in town. My geust for this meal loved the lasagna, and allowed that the sauce was better than most that he had ever had. This seems to be a hallmark of Joe’s: all the sauces are superb. Fresh, tasty, and perfectly spiced, never in-your-face. 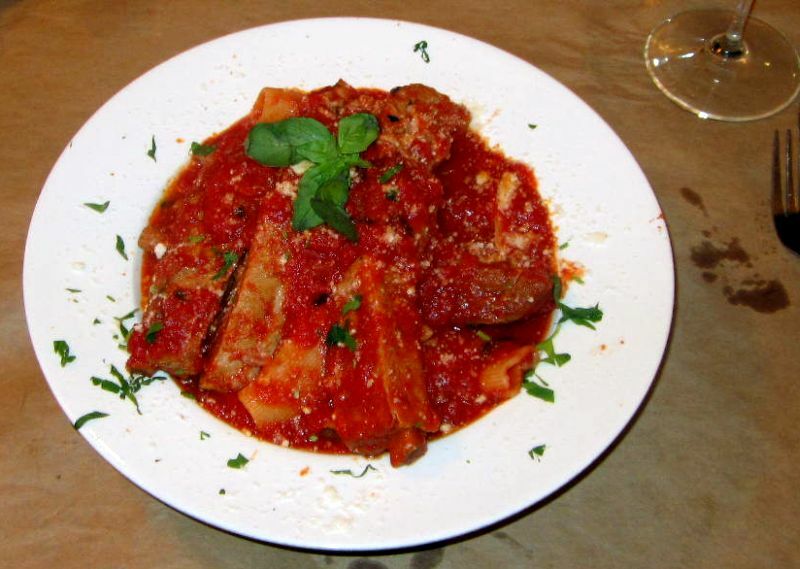 Traditional Gnocchi — Potato gnocchi topped with tomato sauce, served with meatballs and Italian sausage. 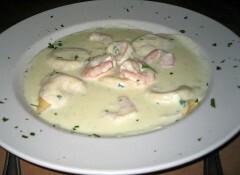 Gnocchi is among Jane’s childhood favorites. This may be the best she ever had. 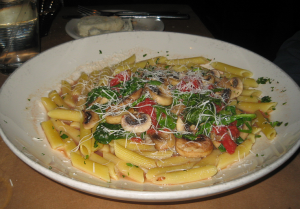 Ziti Florentina — Ziti with spinach, mushrooms, tomatos in a lovely white wile buttery and lightly garlicky sauce. This is among the best versions of this classic dish that I have tasted. The sauce is incomparable. The service was exemplary. Everyone knew our name. Joe kept stopping by making sure that everything was OK (it was better than OK, Joe). So you order calamari in an Italian restaurant and it usually comes out deep fried with a boring red sauce on the side, right? 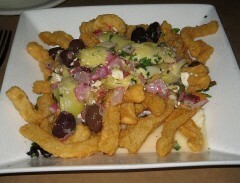 Try Joe’s Mediterranean Calamari when it’s on special. If it isn’t, beg for it. Maybe Joe and Kassie will make it part of the regular menu. Fried Calamari topped with Warm Feta Cheese, Capers, Artichoke Hearts, Red Onions and Calamata Olives in a Lemon Butter Sauce. Outrageously good. I love red sauce stuff, but some of the whites are crazy good. 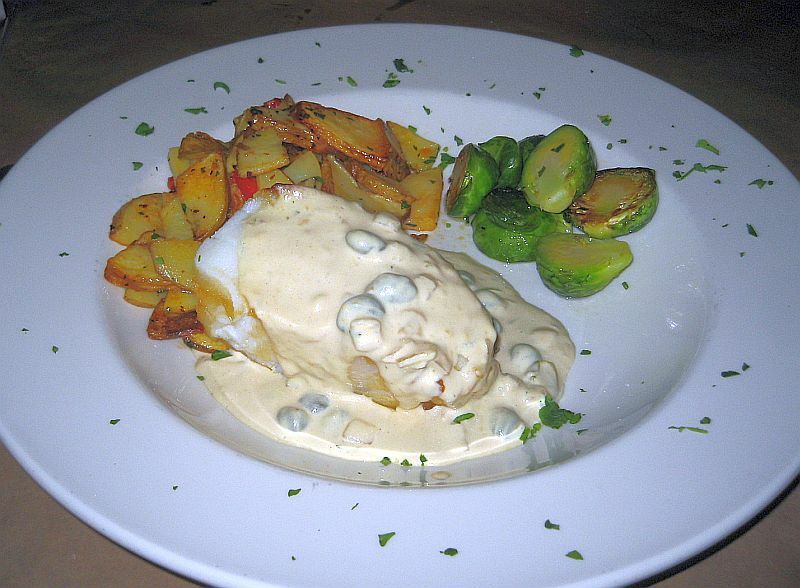 You really need to try the Sea Bass and the Lobster Ravioli. Both are beautifully rich and tasty. 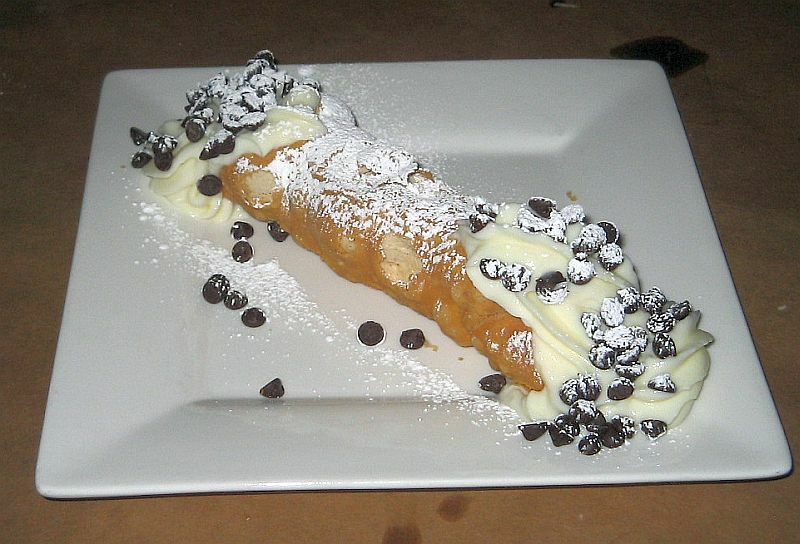 And speaking about rich and outrageously tasty, treat yourself to the Cannoli. .
Alas, Bob Morris, the Italian opera baritone is no longer here. Joe told me that Bob had relocated to Florida (their gain; our loss). There is now a gifted guitarist playing cool, soft jazz. Fine sound. The Specials can be found by looking for them on Joe’s Website. Joe and Kassie know that I love Maryland Crabcakes (here is my prize winning recipe straight from Bawmer where I grew up) and let me know that they would be available last weekend. I gathered seven close friends and showed up after asking Kassie to make sure that they wouldn’t run out. And they didn’t. 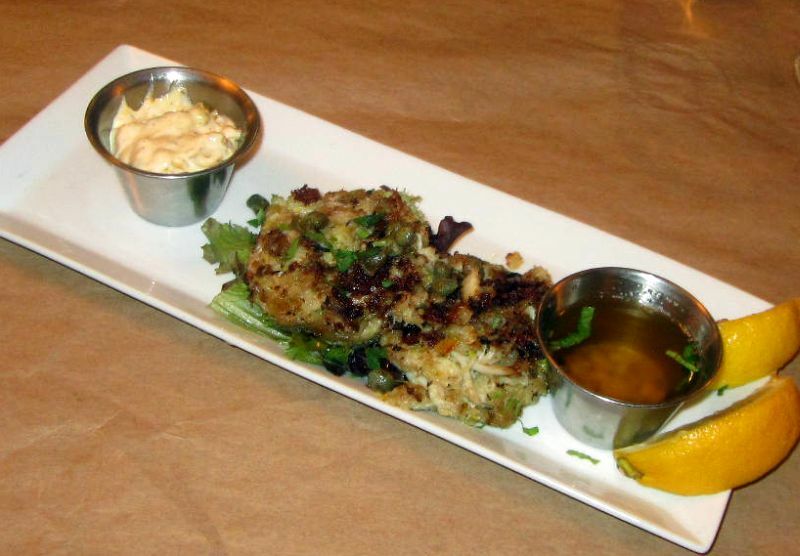 These are excellent crabcakes. Cooked to perfection, they remain lightly browned on the outside and just warm on the inside. Beautiful. They are accompanied by clarified butter and a remoulade dipping sauce which had chipotle added for a slight kick. I tasted the sauce, which is very good, but my Maryland heritage would not allow me to put it on the crabcake. Don’t let me stop you, however. Strictly speaking, Tiramisu is not on the specials list. It is always available. It is special to me. The taste explodes onto my perspicacious palate. 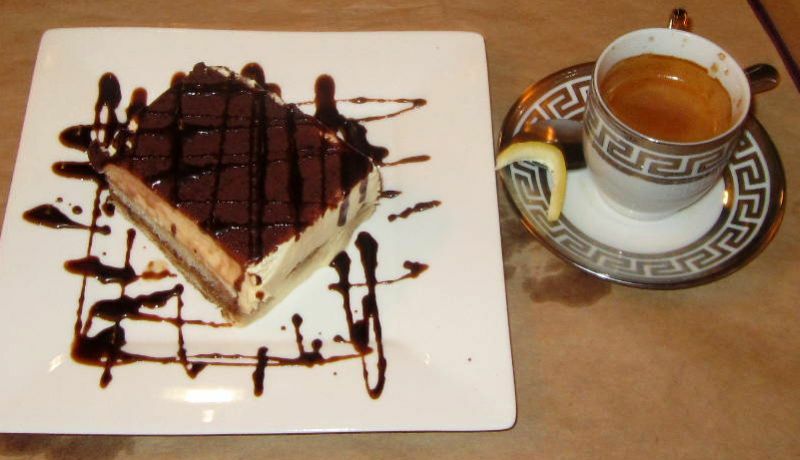 This Tiramisu won (by far — I was one of seven judges) the desserts category at the Fourth Annual Taste of Rio Rancho in February 2014. That makes it special to me. See you again, Joe. Soon as my waistline will allow. Ciao. 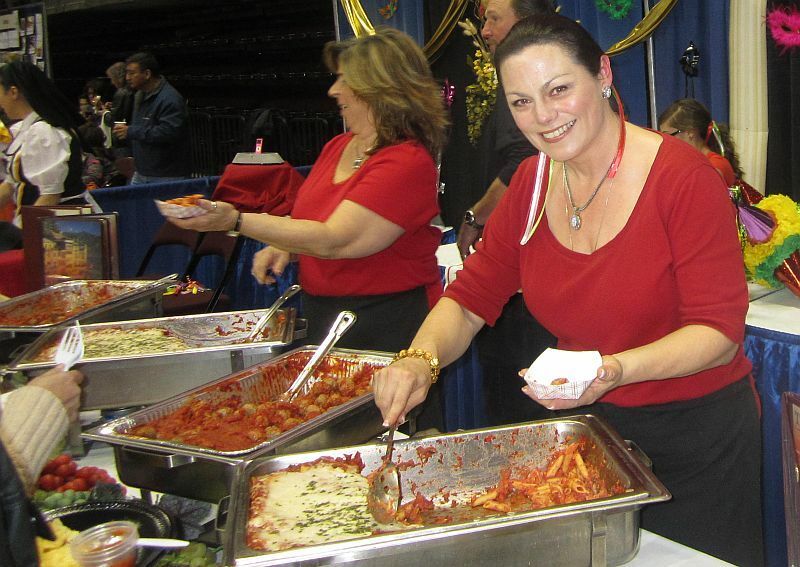 This entry was posted in Honorable Mention, Italian, Seafood, Steaks. Bookmark the permalink. Thank you so much Larry; we really appreciate you & value your opinion highly. 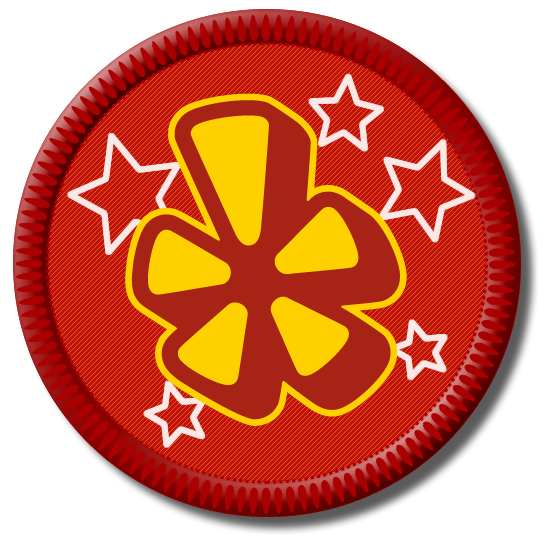 Joe, our Chefs/Cooks & I are very happy to have made your coveted Best Dishes of 2014 list; that is exciting! I am glad I happened to be working on site Saturday night, having had the chance to visit with you & your friends; please thank them for joining us as well. You will be amoungst one of the first to be notified when Joe prepares his Osso Buco for a weekend special… There are quite a few regulars with the same request since it tends to sell out as quickly as the Crab Cakes & Rigatoni with Ribs. One last comment: we hope you are able to blog for a long time to come, Joe & I refer to you, as well as a couple other of our local food bloggers, when considering in which restaurants we may dine. We love you local bloggers sharing all that is devine, delicious & decatant about local establishments! 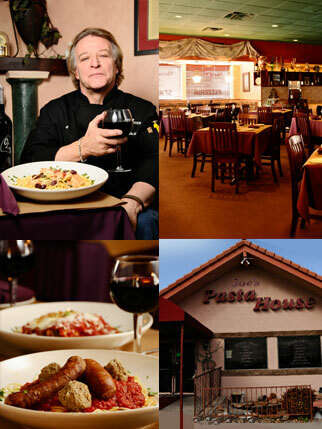 Being a Rio Rancho resident and having dined at Joe’s Pasta House several times I offer a different opinion and experience. First I must acknowledge that Joe’s is the only Italian restaurant in Rio Rancho so for those not wanting to trek to the east side of Albuquerque this is the only choice. Our first visit a few years ago found us somewhat impressed by the the look and feel inside. 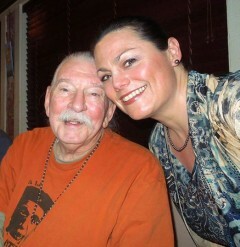 Unlike Larry’s experience we found the owner (Joe) to be on the pompous and arrogant side, he was anything but friendly. We could not help but notice he was wearing a pristine white Chef’s blouse emblazoned with his name along with several food thermomerters displayed in a sleeve pocket yet his blouse did not have any food stains on it from being in the kitchen. The food was average at best, nothing fantastic, and definitely not on par with other offerings in the Albuquerque metro. The service was good to the point of almost being over-the-top by a wait person who was working too hard. Eight months later we decided to make a return trip and give it another try. The food was OK and again we found Joe to be on the unfriendly side and parading around the restaurant as though he was a celebrity chef. 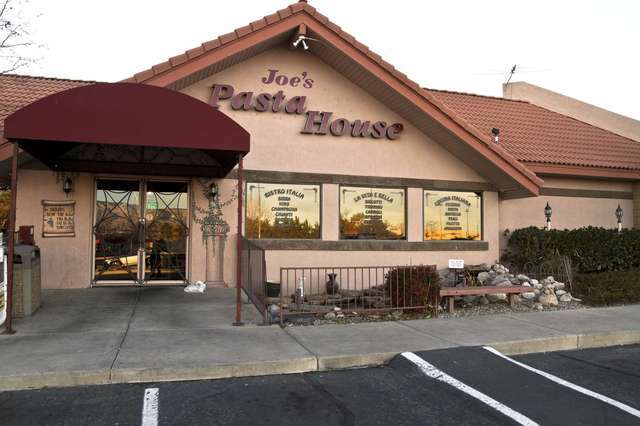 We would not recommend anyone making a special trip to this side of town to dine at Joe’s Pasta House.